Looking to book a holiday this summer? Instead of beach getaways to Spain or the south of France, a recent Barclay’s bank report has found that more and more of us are embracing the idea of ‘staycations’. We are disregarding holidays abroad in favour of domestic retreats – and this new trend is predicted to take off massively in the next few years. This couldn’t have come at a better time for Wales. Voted top travel destination at the beginning of the year, there has never been more on offer in terms of beautiful tourist spots and interesting attractions. Gone are the days of caravans – think romantic countryside getaways, chic city breaks and glamorous beach days for this new trend in domestic holidaying. According to scientists, we’re about to have the hottest summer on record. Grab those beach towels, pack your sunscreen and embrace it while you can! Or if you prefer more active pursuits, how about a cycle around the Monmouthshire countryside? The National Cycling Road Championships are also arriving on the 26th of June. Then again, there’s always time for a stroll through Hay-on-Wye for a browse around the bookshops – the possibilities are endless. Staycations are often much cheaper. Save money and explore some hidden culture – you’ll be surprised at how much is right under your nose! Castles, museums and other cultural hot spots make great days out and they’re often free too. We suggest The Big Pit in Blaenafon for an authentic insight into Welsh history – and it’s less than 20 minutes away from Abergavenny. Getting away doesn’t mean you have to go far – a change of beautiful countryside scenery can leave you feeling perfectly refreshed. Or perhaps you’re looking for a bit of adventure? 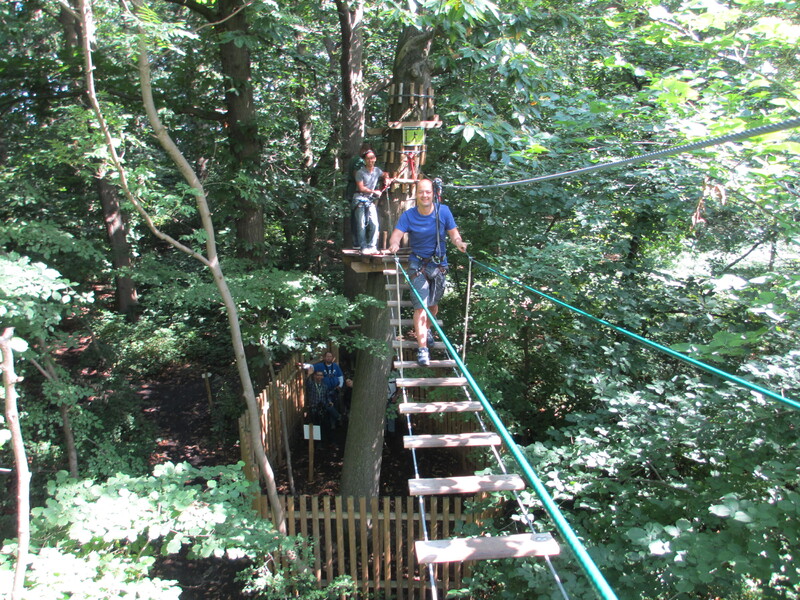 GoApe will leave you feeling exhilarated! Experience zip-lining and climbing through the trees of the beautiful Forest of Dean in an unforgettable outdoors adventure. Just forty minutes away, it’s the perfect day trip if you’re spending the holidays in Monmouthshire. Staycations are fun! Staying local means that you can concentrate on having the perfect getaway without the hassle a trip further abroad may bring. Here at Llansantffraed Court, we pride ourselves on making your getaway as stress-free as possible. Let our friendly team take the weight off your shoulders as you enjoy a relaxing getaway in our peaceful surroundings – our gorgeous grounds are the perfect setting for afternoon tea. Finally, who needs a beach abroad when excitement is right here on your doorstep? Here in Abergavenny, we are delighted to welcome back the Eisteddfod on the 21st June – not to be missed if you’re looking for a traditional Welsh experience on your travels. 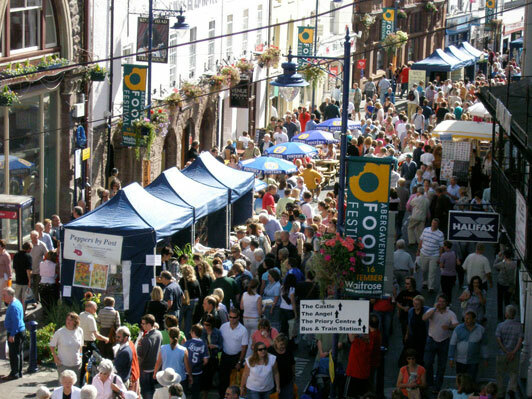 The annual Abergavenny Food Festival in September is sure to tickle your taste buds. Our very own chef, Mike Hendry, will be there for the event showcasing the fantastic home-grown produce we have to offer here at Llansantffraed Court Hotel. Whether it’s camping in the Brecon Beacons, a city getaway in Cardiff or a trip to Monmouthshire, the food capital of Wales, make sure you get out and explore the holiday hot spots right under your nose. Wales has all the offerings of a perfect holiday wrapped up in one convenient package. As Cambridge academic Christel Lane has written in her new book, ‘The Cultivation of Taste’, fine dining is a growing trend amongst those who care about the quality and origin of their food. At Llansantffraed Court, we take great pleasure in ensuring everybody can enjoy a fine dining experience at an affordable price. Whilst this new foodie generation is largely made up of professionals, we believe fine dining shouldn’t just be restricted to just adults. Food blogger Nikki Vivian recently visited us with her eight-month old daughter Amelie. Our Head Chef, Mike Hendry, prepared a fresh halibut, artichoke and langoustine dish for Nikki, and a perfectly presented smaller portion of the same dish for Amelie. Family-friendly fine dining is being introduced in an increasing number of restaurants, including The Ivy in London, although the trend of advocating high-end dining as a family experience has proved a contentious issue in the USA. Widening our clientele to include children not only enables kids to be educated about the origins of their food from an early age, but can also help to improve their palette. We feel providing a range of choice for children is a welcome alternative to the pureed and processed food that can often appear on restaurant menus. Children should enjoy the same meals as adults, and educating them about the variety of flavours available at an early age is important. At Llansantffraed Court, children can take a trip to our walled garden where we grow our own vegetables and herbs. This gives them an opportunity to learn how produce grows and the importance of eating fresh, healthy ingredients. We aim to create an environment where families can relax and we’re delighted our customers, 9 or 99 years old, can enjoy the variety of high-quality food we have to offer. Last month, our neighbouring town, Monmouth, was voted the third best place to live in Britain. Much like Abergavenny, which ranked in the top ten last year, Monmouth has been recognised by voters for its friendly atmosphere, striking location and great local culture. The Sunday Times described the Welsh market town as having ‘a charm of its own’, and we couldn’t agree more. 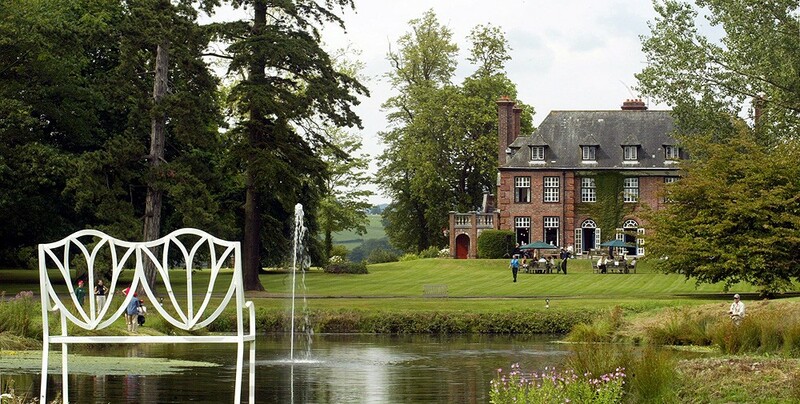 Surrounded by Monmouthshire’s beautiful rolling countryside, it offers something for everyone – tempting many to make it their home, and also attracting holidaymakers, weekend visitors, or those just looking for a pleasurable day out. 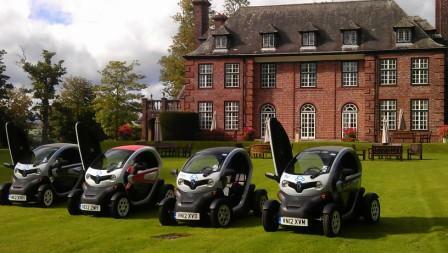 Hiring out our very own electric car, Tipyn, is a perfect way to explore Monmouthshire’s rural delights. Completely free to use by our residents, it’s a perfect way to explore the local sights and is also environmentally friendly as it runs on 100% renewable green energy. Whilst out in ‘Tipyn’, you can discover the beautiful Wye Valley, which is on our doorstep. 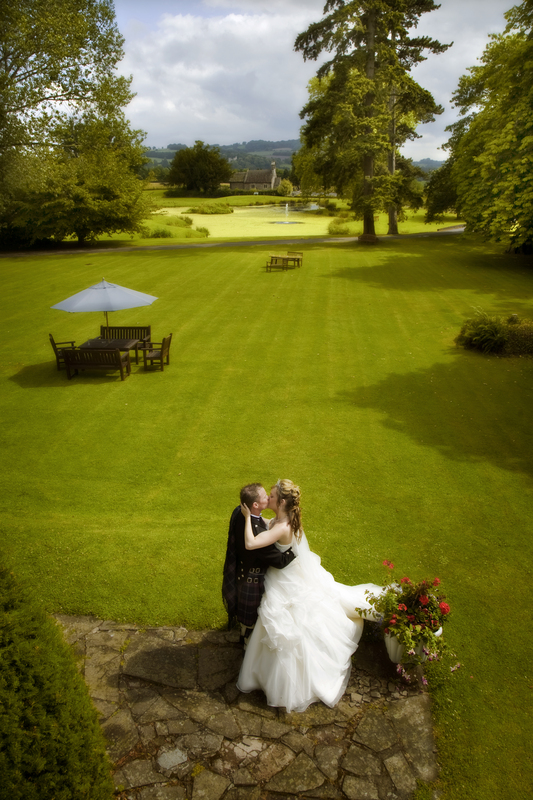 If you’re looking for some well-earned rest, you can also enjoy beautiful views whilst having a delicious afternoon tea of homemade sandwiches, scones and cakes, looking out onto our 20 acres of immaculate lawns. After afternoon tea, you can go on a nature walk along our local footpaths or if you’re feeling a little more adventurous, you could try some horse riding, play golf, fish or hire bikes. On a hot summer’s day, how about renting a boat or canoe on the River Wye? If you want to try something completely different, we’re situated near to a 4×4 driving school, a forest adventure centre and a hot air balloon base. For the foodies amongst you, Monmouthshire is known as the food capital of Wales for a reason. With an abundance of locally sourced produce, award-winning vineyards and fantastic restaurants there’s plenty to tempt your taste buds. Our own restaurant was crowned ‘Best Small Place to Eat’ in the recent National Tourism Awards for Wales and we pride ourselves on delivering high-quality, fresh and seasonal dishes at a reasonable price. You can see more details on our restaurant here. If you enjoy food festivals, our annual Abergavenny Food Festival was voted the ‘Greatest Event in Wales’ and has been described as the food festival equivalent to Glastonbury. Our own Head Chef Mike Hendry did a cookery demonstration there last year, and it is an experience that can’t be missed. Aside from exploring the impressive food scene, the bustling main streets of Abergavenny and Monmouth offer a great variety of shops, from big brands to family-owned, independent businesses. Sticking to its traditional routes, Monmouth stills holds a popular market, selling a wide range of local produce every Saturday. So, don’t limit your adventures to the British seaside or a Spanish resort, charming villages, wonderful scenery and historical sites are saturated throughout Monmouthshire, and you can’t get much better than that. Non-alcoholic drinks are becoming increasingly popular in Britain. 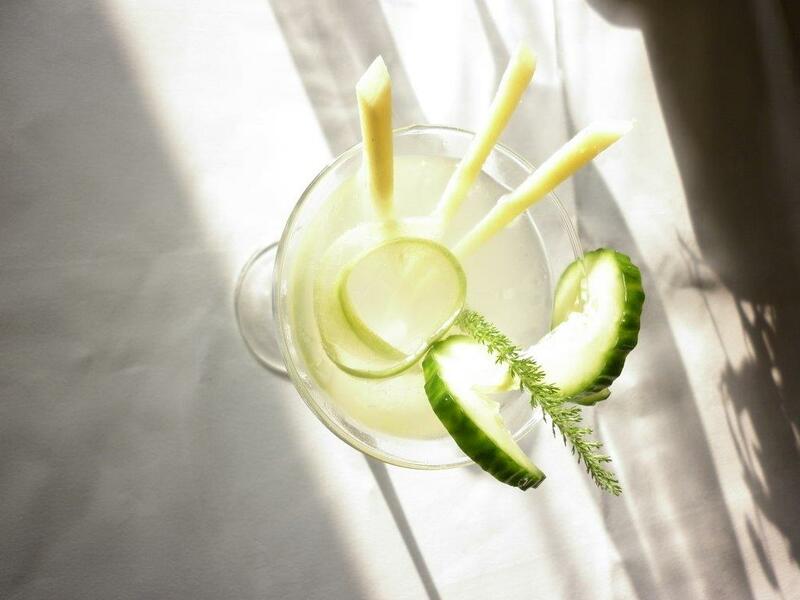 With London’s first alcohol-free gastro bar opening in July and more people than ever being concerned about the health implications of over imbibing, restaurants are starting to offer creative options for those not wanting to consume too much of the hard stuff. The growing variety of alternative drink options is welcome news for people that avoid alcohol, including those that are pregnant or abstain for religious reasons. Whilst wine is a delicious addition to any meal, and enhances many of those amazing flavours, some of us do like to temporarily avoid it, whether we are the designated driver for the night, dining with children or just have work the next day. Sometimes being able to sip a sumptuous well matched ‘light’ drink with our dinner is a welcome alternative and comes without the added headache the following morning. There’s more to the world of soft drinks than sparkling water and fruit juice – the variety of flavours featured in new beverages on the market are not only diverse but also interesting. Ranging from mocktails (an alcohol-free cocktail), spritzers, sodas and punches, they can be sweet or savoury and often involve a delicate balance of herbs, spices and fruit. A tall mocktail served over crushed ice provides welcome refreshment on a hot summer’s day. In the winter, mocktails can combine mulled fruit and spices, which is a fabulous alternative to red wine on cold winter evenings, but still keeps a similar depth of flavour. Fruity punches can mix tropical flavours to create an exotic and thirst-quenching taste. It’s fun to challenge the palate with different temperatures and textures too. For a more grown-up feel, spritzers can be fizzy and served with floating fruit; a great way of involving the children. For those who prefer savoury tastes, simple ingredients, such as basil water, can be a brilliant accompaniment to Italian food. To ensure you can have an enjoyable evening at Llansantffraed, regardless of whether you have the car keys or not, our Food and Beverage Manager, Charlott, has created a new mocktail menu, with each drink cleverly matched to a course on our tasting menu. This ensures everybody can enjoy our dishes, without having to miss out on tasty drink options. Have you got any favourite non-alcoholic drinks or would you like to share your own mocktail recipes? We’d love to hear from you! Many New Year resolutions include healthy eating and exercise. However, the rainy evenings and cold winds kindle cravings for warm apple pie and custard in front of the fire. If you’re determined to stick to your 2014 diet plan, then why not have a dabble with the new ‘clean eating’ trend? Simplifying your diet to natural and unprocessed ingredients is very much in line with our commitment to using the freshest of local ingredients. Eating whole foods like vegetables, whole grains, free-range meats, diary products, nuts and seeds epitomises the ‘clean eating’ process, also known as the ‘paleo’ or ‘caveman’ diet. Removing refined sugar and complicated carbohydrates like white bread and pasta is crucial to the plan and most importantly cooking your own dishes will ensure you know exactly what’s going into your body. Creating simple but flavoursome dishes is key to sticking to the plan. To inspire you, Head Chef Mike Hendry has put together a delicious recipe mixing artichokes, mushrooms, samphire grass and fresh, seasonal halibut. Artichokes have a high-level of antioxidants but also lower cholesterol. Halibut is a fish with low fat content, which will prepare you for the summer months on the beach. When frying fish, Mike recommends using Welsh rapeseed oil as it prevents burning and doesn’t add strong flavour to the food. On a health level, it has less saturated fat than cooking oils and it is a rich source of vitamin E.
Pan-fried halibut with oyster mushrooms, artichokes and samphire grass. Like Charles M. Schulz famously said: ‘All you need is love. But a little chocolate now and then doesn’t hurt.’ Although Valentine’s Day is a traditional celebration of love, here is a chocolate fondant recipe to inspire the romance in you at any time of year. The classic chocolate fondant is the king of all desserts: it has a reputation for pure indulgence, and rightly so! Combining high quality chocolate, butter and cream, this pudding is hot with a luxuriously soft centre and a rich chocolate flavour. If you’re planning on serving up a treat for your other half and are unsure how to finish your three course extravaganza, the chocolate fondant is a perfect accompaniment to any romantic menu. Not only will your date be left impressed, but some experts believe that chocolate may have intrinsic aphrodisiac qualities due to the stimulant phenylethylamine and the serotonin-building chemical tryptophan found within it. Many of the most sensual menus end with this delicious dessert, so make yours a roaring success by recreating this at home. This precious recipe from our Head Chef Mike Hendry will be a perfect finale for any lavish romantic dinner. This recipe will feed five people so you can save some for later or even freeze the fondants for another day. For most couples, their wedding day is the biggest and best day of their lives. Surrounded by loved ones, great friends, it’s a celebration of two households uniting and carving a piece of family history forever. Such an important day requires careful planning – from the bridal gown to the cake stand, every detail is significant. As catering performs such an important role on your wedding day, it is helpful to ensure that you are familiar with the style and provenance of the ingredients and finished dishes available at your chosen venue. Any good quality caterer or venue will be pleased to arrange for you to try samples of dishes and preview the presentation, for instance, here at Llansantffraed Court we offer a tasting to the couple and parents a few months before their big day. Another useful tip is to get references from previous brides and grooms, perhaps check some internet resources such forums; that way any reservations can be put to rest. Whether it’s post ceremony canapés, the wedding breakfast or a grand evening buffet, your wedding food should mirror the day’s theme. For a summer wedding, an lighter option might include a stunning carved buffet comprising of fresh salads or tapas and cold cuts of Welsh charcuterie. If, however, you’re planning on having a wonderful winter wedding, think about a more traditional Welsh themed meal such as Loin and shoulder of Monmouthshire lamb, butter braised potato, and seasonal garden vegetables. If you’re after something a little quirkier, an interesting option may be to have a wedding cake made out of cheese to be served with a selection of biscuits and homemade chutney. Whatever you choose, do be careful not to overload your guests if you’re expecting them to throw some shapes on the dance floor later. Take advice from the Head Chef and Management at the venue as they will have a wealth of experience about how to balance a menu carefully. Many suppliers or venues can tailor dishes to meet your requirements. If there’s a particular meal you love, they may well be able to adapt it for your wedding. Don’t rule out personalising your day by bringing your ideas for Chef to adapt for your wedding breakfast: it would certainly make your wedding unique. After all, your day should reflect your personalities and tastes. A little trick is to always be mindful of the seasons. Using non-seasonal ingredients may result in some consequences, for instance winter strawberries are often flown in from overseas, with transport costs passed on to the customer, and the taste will not reflect your surroundings. Buying seasonal ingredients always improves the taste too, as discussed in our previous blog on ‘food miles’. An ingredient that has been grown within a few miles will save you money and create a more delicious dish. For a great example of this, here at Llansantffraed Court we grow an abundance of seasonal vegetables in our large restored walled garden, and use preferred local suppliers to ensure food is consistently fresh all year through. Be sure to ask the venue about what fruit, herbs and vegetables and even meat, will be in season when your big day comes around, and how they source it. Wedding cakes are traditionally the centrepiece of any wedding, but why not try an additional dessert board instead? The latest trend is having a dessert board comprising of either full-size or mini versions of family favourites for your guests to choose from. This modern twist on classic desserts means you can customise options, for instance providing wheat and dairy free alternatives for your guests. An advantage is that more of the wedding cake will be left over for you to take home – think of it as your first wedding present! Your wedding day is about you. However, choosing menus for the big day often involves attempting to balance what you’d truly like with crowd-pleasing dishes. Your wedding day should reflect your tastes and values without being insensitive to guests’ palates, but don’t be afraid to be different by going for having a ‘feasting’ menu to surprise your guests and get them mingling, or a full vintage themed afternoon tea. Focussing on food that reflects your individual personalities will showcase something unique about you as a couple on your special day. We hope these top tips will solve your wedding food issues in no time, so you can enjoy your big day! For more advice and friendly chat feel free to just give us a call anytime. A New Year symbolises a fresh start and a chance to wipe the slate clean – or in our case, the plates clean! We all enjoy making resolutions – a common one being to eat healthier. While many of us will calorie-count all the way through January until succumbing to a Mars bar in February, eating healthily doesn’t have to be the calorie-counting, rule-heavy activity its often made out to be. Eating healthily can be as simple as eating more fresh produce or even growing it yourself (see our guide on growing vegetables here). It is no secret that, with over 100 different varieties of vegetables, fruit and herbs in our own walled garden and a contact list of brilliant local suppliers, we’re passionate about local fresh produce. Eating food sourced locally doesn’t just help the community and independent suppliers, but also the environment. ‘Food miles’ is a term used to describe the distance food to get from the farm to the plate. The more ‘food miles’ a product has, the more fuel is used in the process of getting it to you. There is also an impact on freshness – a tomato from Spain will take more time from harvest to a dish, so won’t be as fresh as one grown in your back garden, for instance. When you open that sealed pack of tomatoes from the supermarket looking invitingly still attached to the vine, believe us, the smell is from the vine, not the tomato! One of the great advantages of living in Britain is the seasons. We’re particularly proud that, whatever the time of year, there is something that can be grown and used in the restaurant. Anything from potatoes to beans, cabbages, cauliflowers, asparagus, roots, greens and herbs can find its way to our tables. Having seasonal variations also makes menu planning more exciting, ensuring there is plenty of opportunity to experiment throughout the year. For an avid foodie, it is very satisfying to grow your own salad or vegetables, prepare a meal and eat it on the same day – safe in the knowledge that you have used zero food miles. Of course, you can’t always avoid food miles or food yards in our case – for example it isn’t possible to grow bananas or pineapples in the UK – but it is possible to grow lots of fresh fruit and vegetables at home. It’s a fun activity to do with your family and you don’t necessarily need a big garden or allotment to experience the excitement of growing your own fresh crops. Mixed salad is a wonderful food to grow all year round and you don’t even need a garden, as you can grow it indoors. One of the fantastic things about growing mixed salad leaves is that you can keep picking the leaves and the stumps will grow back two or three times. You will have seen ‘micro greens’ on many a good restaurant’s plate in recent years, and these tiny explosions of flavour are surprisingly easy to produce. We plant them in long pieces of semi-circular drain pipe gutter. You can grow mixed salad leaves from the seed and you can even buy pre-seeded pots and trays from some shops and supermarkets. There are many different types available and you can buy seed packs containing lettuce, rocket, spinach and host of different leaf varieties. If you like specific varieties then buy separate seed packets and blend to create your own unique salad mix. Tomatoes are a green house favourite and very easy to grow. They can be planted from the spring and there is a huge variety available with different flavours and colours – they can be grown from seeds or you can buy plugs (small plants that have already started growing). Tomatoes are best grown in a green house but they can be grown outside as well. We love heritage varieties for their flavour, and yellow plums to tomatoes as they look so great on a dish. Potatoes are a fun vegetable to grow at home because they are easy to care for and you can even grow them in a large pot on the patio. You can buy ‘seed’ potatoes from the garden centre and if you pick an early variety and plant in March you should have a crop by late May/early June. Try to sow successions so they don’t all come at once. Strawberries are very adaptable plants. They can be grown in the garden, in a large pot or even in a hanging basket. You can usually buy plants from April onwards. Pot them up and you’ll have delicious fruit in time for Wimbledon! This season we are trying a new variety of white strawberries, yes, white! …We’ll keep you posted. 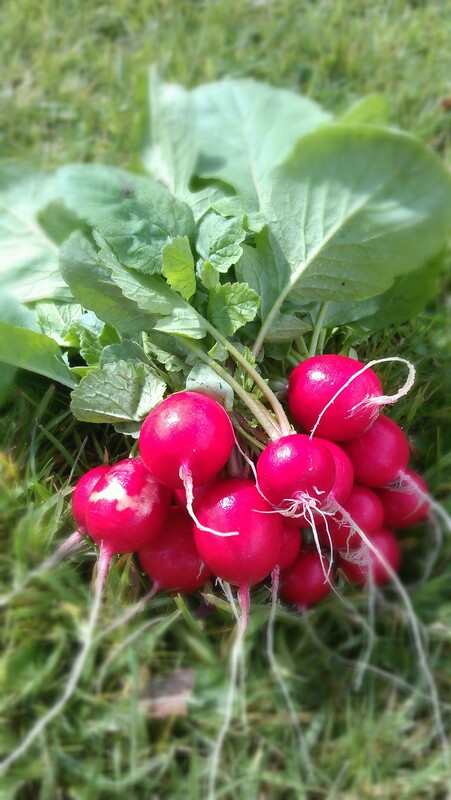 We hope we have inspired you on to your own fresh food adventure and we would love to hear how you get on in 2014. We’re excited to launch our inaugural Christmas party for the festive season ahead. There’s something rather rebellious about partying the night away in the middle of the idyllic Welsh country side, isn’t there? 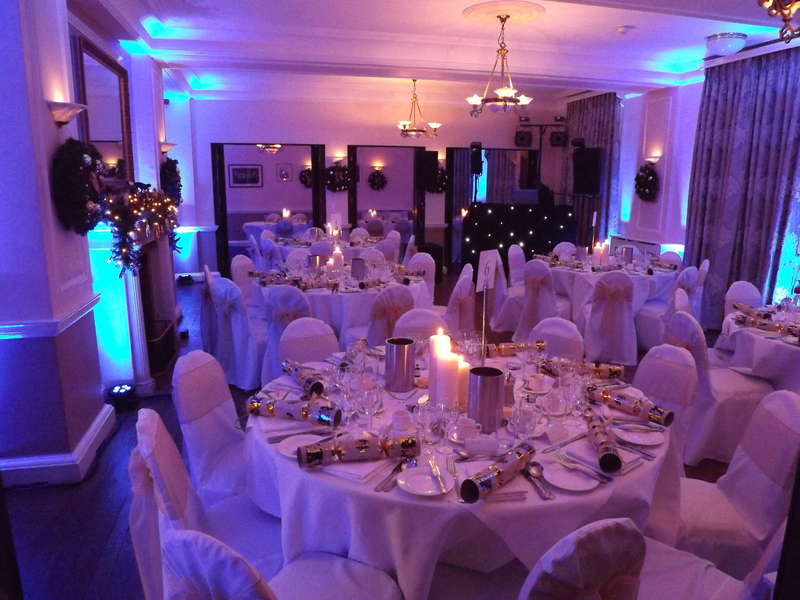 Christmas parties come alive at Llansantffraed Court this winter with a chance to dine and dance the night away with your colleagues, family, friends and loved ones. Of course there’s turkey, tinsel and all the expected trimmings but you know you can count on that something slightly more special from our award winning Welsh restaurant. Ham hock, veloute, some sumptuous salmon, brilliant bass, an adventurous red onion strudel and a chocolate pudding that usually commands a silence without having to say a word. There’s no better way to work off that dinner than dancing the night away. On December 14th we have our resident DJ lined up for a Christmas disco like no other. Prices are £38 per person. Bookings can be made for complete tables of 10 or on an individual basis. 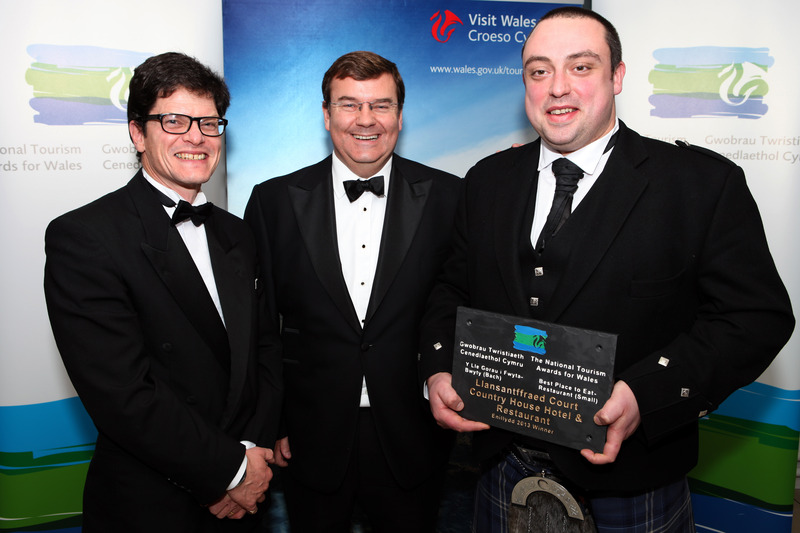 Last Thursday, Owner Mike Morgan and Head Chef Mike Hendry, dusted off their dinner suits and headed North for the National Tourism Awards for Wales to hear whether we would be crowned winner of the Best Place to Eat – Small Restaurant category. A fair few nails were bitten in the run up to the results, but they had an excuse to pop the bubbly when our name was announced by host Aled Haydn Jones of Radio 1. It’s fantastic to have won such a prestigious national award. The judging process was rigorous, but best of all the final winner was decided by public vote and it means our wonderful team’s dedication has been recognised. With this brand new title, we are confident 2014 is going to be going to be full to the brim with brilliant food. Where should you go during National Parks Week?